Angelica Panganiban engaged with John Lloyd? Home » Showbiz » Angelica Panganiban engaged with John Lloyd? Actress Angelica Panganiban latest upload photo from Instagram is her hand wearing a diamond ring. 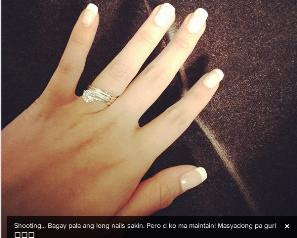 Many netizens speculated that her ring is her engagement ring from her actor boyfriend John Lloyd Cruz. After posting a photo with the logo of mercedes benz which allegedly gift by her boyfriend, another expensive gift which many of her twitter followers agreed that the ring was given to her by her boyfriend. Meanwhile, Panganiban and Cruz spotted holding hands while leaving the 6th Star Magic Ball Awards last September 1, 2012. In case you want to share you reaction regarding to this story, kindly leave your comment below and please share it to your Facebook, Twitter and Google+. Comments or suggestions about "Angelica Panganiban engaged with John Lloyd?" is important to us, you may share it by using the comment box below.